In our online world, business owners know the value of content marketing: for authority, for SEO and to turn their website into a hub of knowledge. And if you’re always blogging, good on you – it’s hard work to keep up that momentum. But now you’ve written loads of blog posts and/or articles, what are you doing with them? There’s nothing worse than doing all this work and then letting them disappear into cyberspace. What a waste! And although there are many, many ways to reuse your blog content, this case study looks at how one client used his articles to create an e-book. He uses this on hise website as a free download and has been building his list ever since. Tony Crosby is the Director of Associated Career Management in Australia. He’s written heaps of articles for job seekers and people wanting to hone their career direction, but they’re all sitting in limbo on his website. Every time he posts an article, Tony shares it on his social media channels, but after a while, they go into the world of ‘the forgotten blogs’. And I’m sure many of you could relate to this. But Tony’s articles have valuable information, and he knows it. Looking at ways to repurpose his content, Tony (a client since 2011) asked us to convert his articles into a branded e-book he’d use as a free download. So, we did. 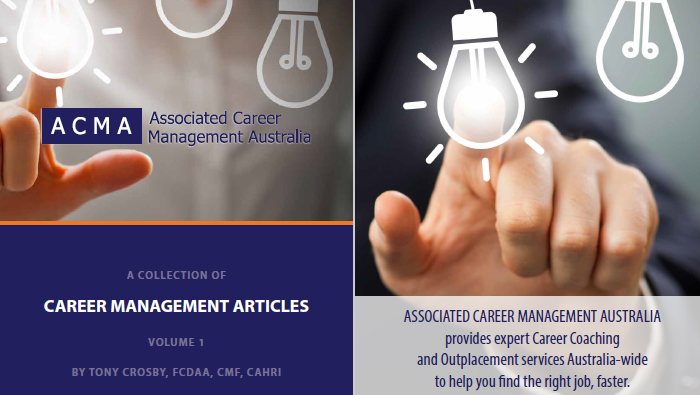 To see the result, please download Tony’s e-book, ‘A Collection of Career Management Articles’ or click the image below. Want to save your content from being lonely and lost in cyberspace? It’s a shame to lose your blog posts and articles into cyberspace. Your target audience is wanting to read what you’re putting out and will appreciate your knowledge. But there’s no point advertising your blog when you first write it only to forget about it. Make sure you’re making the most of your valuable content. Ask us about converting your blog posts and articles into a branded piece of marketing collateral! Contact us today.